St. Joseph is honored with feast days throughout the Liturgical Year. This feast encourages us to look at Joseph's role as husband and head of the Holy Family. Most of what we know about the life of St. Joseph comes to us from Scripture and legends that have sprung up regarding his life. Though Joseph is only mentioned by two of the evangelists, he is paid the compliment of being a "just" man. This is a way of saying that Joseph was such a good and holy man that he shares in God's own holiness. In addition, Joseph gives us an example of how to be a just spouse and how to have holy relationships. Joseph's example as a husband can be best seen in how he respected Mary. He realized that God had a special plan for his wife and for his son, and Joseph did everything in his power to help this plan become reality. When Joseph was given chances to give up his vocation to the married life, by divorcing Mary or leaving her, he resisted the temptation and stayed by her side providing support and love. 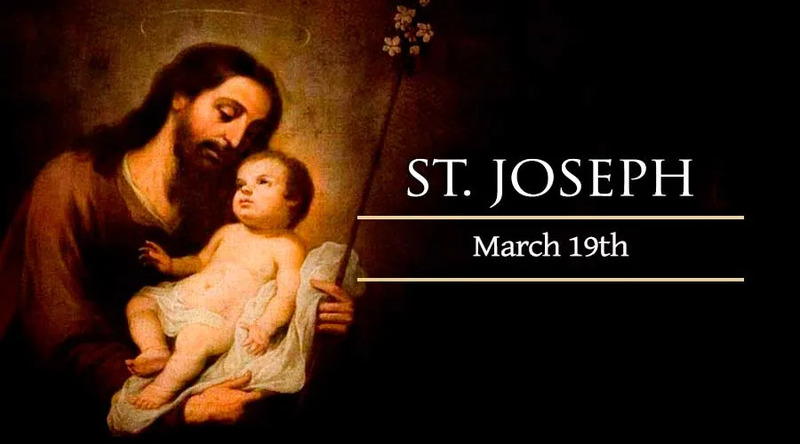 The feast of St. Joseph Husband of Mary has been celebrated throughout the church since the tenth century and has been honored as the Patron of the Universal Church since 1870. St. Joseph is the patron of workers, carpenters, Austria, Belgium, Bohemia, Canada, Mexico, Peru, and southern Vietnam.